Shared Cup ~ each sips from the glass of wine. A standard wine glass, a metal goblet or a personalized etched glass. Anything you like. Burning Bowl ~ releasing the past to start anew. Just the two of you OR the whole family. Everything needed is provided. Unity Candle ~ uniting the two of you OR involve all of your children also. Unity Sand ~ Joining two as one. Also a wonderful option for involving the children. 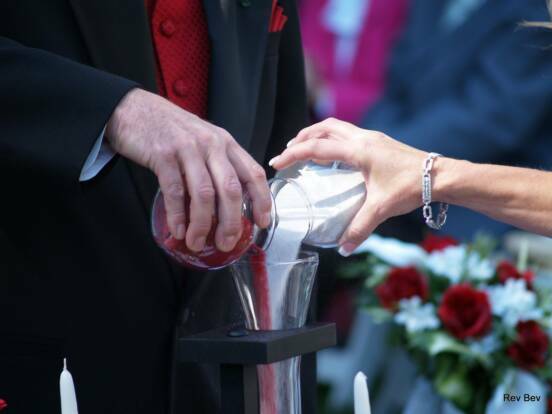 Great alternative to the unity candle when having an outdoor ceremony. Endless options for style of vase and colors of sand. Celtic tradition involving 6 commitment vows with a binding made after each. Some couples choose to have the 'year and a day" recommitment ceremony the next year to fulfill the hand fasting tradition. Stepping over the broom ~ This tradition is based on many different cultural ways. Seen here is combined with stepping over the sword. And look what fun you can have afterwards! Photo converted to canvas oil painting. Your wedding day can live on in history with a comemorative brick. This one seen is included in your wedding package at Sarah Hite Memorial Rose Garden in Milwaukie. Whatever you choose, let your wedding day be a reflection of the two of you. Don't be afraid to do things YOUR way. Below are a few example of how couples made their ceremony unique to them. 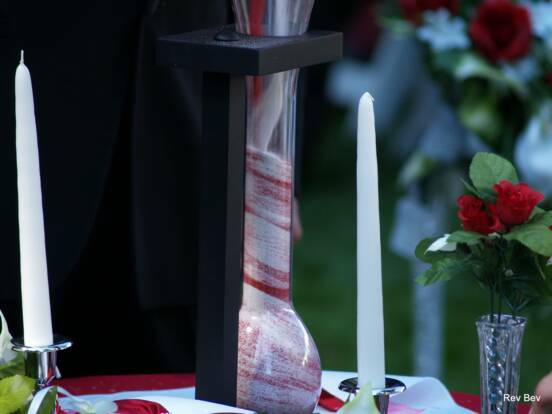 <left ~ added to the unity candle table was also an eagle feather, cystal quartz and a single red rose. Each represented something personal to the couple. A couple chooses to be married in a cave at the beach then walk across hot coals together. This bride wore her dream wedding gown while the groom was comfortable in jeans, leathers and dew rag. Conforming to the theme, the bride wore her leather boots with her gown (seen above holding champagne glasses) and the ring bearer wore matching attire to the groom. Nothing more beautiful than a wedding gown on a Harley!